Since the creation of minority-dominated congressional districts eight years ago, the Supreme Court has condemned the move as akin to "political apartheid," while many African-American leaders argue that such districts are required for authentic representation. 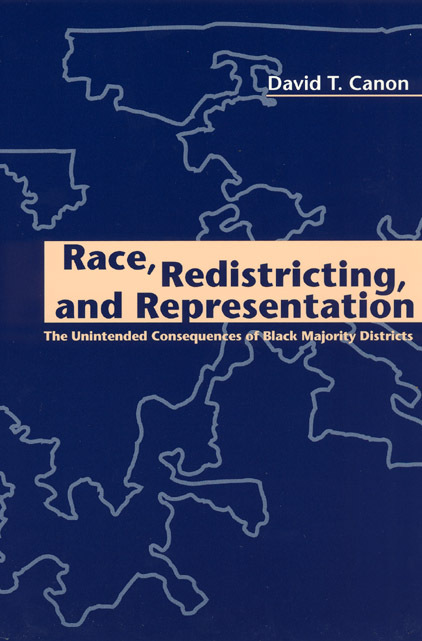 In the most comprehensive treatment of the subject to date, David Canon shows that the unintended consequences of black majority districts actually contradict the common wisdom that whites will not be adequately represented in these areas. Not only do black candidates need white votes to win, but this crucial "swing" vote often decides the race. And, once elected, even the black members who appeal primarily to black voters usually do a better job than white members of walking the racial tightrope, balancing the needs of their diverse constituents. Ultimately, Canon contends, minority districting is good for the country as a whole. These districts not only give African Americans a greater voice in the political process, they promote a politics of commonality—a biracial politics—rather than a politics of difference. Chapter Six: Black Majority Districts: Failed Experiment or Catalyst for a Politics of Commonality?